If you have a young teenage son, it’s time to sit down and talk about testicular cancer. This form of cancer is not common, but it favors males aged 15 to 35. Although no family wants to hear, “Your son has cancer,” testicular cancer responds well to treatment. When discovered early, it has a cure rate of nearly 100 percent. Best of all, testicular cancer doesn't require testing to be discovered; it can be felt. So, to protect your son, teach him how to perform a testicular self-examination. 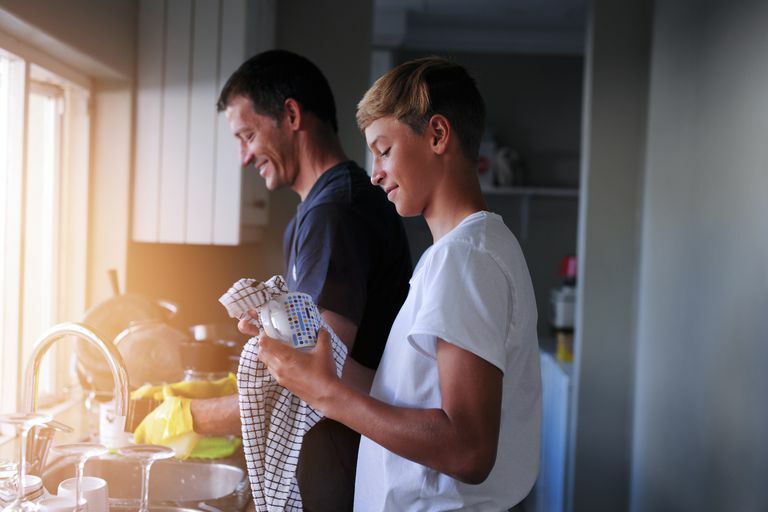 A recent national survey conducted at Cleveland Clinic found that men who have spoken to their sons about this disease say that age 11 or 12 is the ideal time to have the conversation. Actually, any time in early puberty should be fine, so long as by age 15 a young man knows how to perform a self-examination and understands the value of doing it monthly until he reaches the age of 45. Is Your Son at Risk? About 8,000 cases of testicular cancer are diagnosed in the U.S. every year. There may be some familial risk, but it’s not as strong as the genetic risk associated with cancers of the breast, colon, and prostate. Nevertheless, if there is any testicular cancer in your family, your son may be at higher-than-average risk for the condition. The highest risk of testicular cancer is associated with undescended testicles. Any male born with an undescended testicle has a risk of testicular cancer that is about four to eight times that of the general population. The risk remains elevated whether the testicle drops by itself or is surgically descended during the first year of life. Even more, testicular cancer can occur in the contralateral, normally descended testicle—although it is more common to occur on the side that was undescended. In the past, it was necessary to surgically bring down the testicle in order for a lump to be felt during self-examination. There was also extra incentive to do this since an undescended testicle increases the risk of fertility problems, so surgically descending a testicle offered double benefits. More recently, however, a study indicated that early intervention to descend the testicle may decrease the relative risk of testicular cancer. Although this finding will need to be corroborated by additional studies, the results are encouraging. The purpose of a monthly self-examination is to notice any change in a testicle that occurs from one exam to the next. This could be a lump, bump, or swelling that wasn’t there before. You can’t wait for pain to occur, because cancer is usually painless. However, to know what you are looking for, you need to know what normal feels like. Testicles may not be perfectly matched. A little asymmetry is normal. One may be more oval than the other, and one may be larger. This isn’t always cause for concern, but it should be brought to a doctor’s attention just to make sure. Stand in a hot shower, allowing the testicles to descend. Press down gently while sliding your thumb and forefinger downward until your hands meet. It should feel uncomfortable, but not painful. As the testicle rolls back and forth, you will be able to feel any lumps or bumps in the meat of the testicle. He should not be embarrassed because he did not cause it and he could not have prevented it. He should not wait to see if it goes away because that would be taking unnecessary risks with his health. You are proud of him for taking responsibility for his health. There’s a chance that if your teen son finds a lump or swelling, it will be a cyst, benign tumor, or dilated vein rather than cancer. But no matter the finding, teaching him what to do to protect himself—and how to do it—lets him know you care about his health and that he should, too. Pettersson A, Richiardi L, Nordenskjold A, et al. Age at surgery for undescended testis and risk of testicular cancer. New Engl J Med. 2007;356:1835-1841.